It takes up to 10 years to develop and build a new nuclear power plant that will then operate for 60 years or longer. Electricity markets and financial markets do not easily accommodate these long-term nuclear power plant assets. Nuclear power plant value is based on the value of electricity generated. Estimating the value of electricity decades in the future is difficult, especially if the electricity is sold into an electricity market. 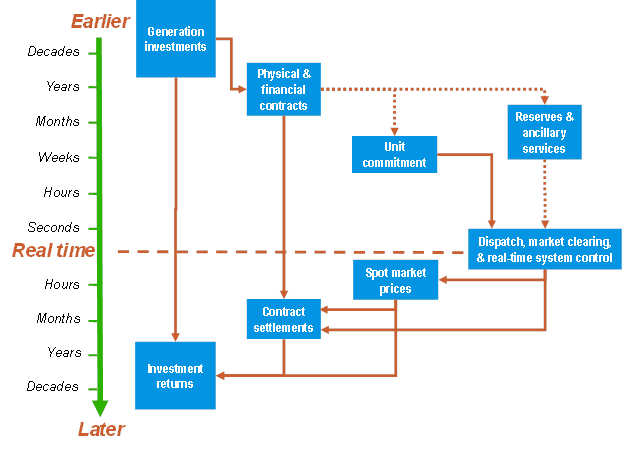 The figure above shows the activities that happen in every electricity system. Investments are made in power plants, transmission lines, and other infrastructure. The power plants provide electricity, capacity, and ancillary services to meet fluctuating system demand in real time. In the first approach, activities are done from left to right. Long-term plans are made for new generation plants and other infrastructure to meet projected customer demand with the objective of minimizing long-term total system costs. System expansion planning is based on models that include both long-term costs and short-term operating costs. This approach usually results in a portfolio of generation types, fuels, and locations. The generation plants built under this approach are dispatched (i.e., turned on or off) by the utility to meet customer demand at the lowest marginal system operating cost (i.e., fuel and variable O&M). In this first approach, nuclear power plants provide an option for low-marginal cost baseload power in utility generating portfolios. In the second approach, activities are done from right to left. Short-term electricity market spot prices (and expectations of future spot prices) are expected to provide economic signals for power plant investments. Electricity market spot market prices are intended to reflect the marginal cost of electricity in each trading period. Predicting the marginal cost of electricity in the future requires modelling of demand, generation mix, fuel prices, new entry, and other factors that may change significantly over the decades that a nuclear power plant operates. Electricity spot market prices may be capped or distorted by out-of-market payments to generators (e.g., renewable subsidies). Electricity market spot prices that do not reflect actual system marginal cost are hard to predict, make existing power plants less profitable, and reduce the expected revenues that would support new power plant investments. Actual electricity markets may also include other features such as locational pricing, unit commitment, security constraints, ancillary services and reserves markets, capacity markets, preferential dispatch (must-run) or hedge contracts. In the first approach, the regulated or government utility builds a portfolio of generation to meet customer demand at the lowest long-term cost. In the second approach, the electricity market is expected to deliver generation investments, as private investors undertake projects to maximize their profits and minimize their risks. These private investors do not have incentives to minimize long-run total system costs. Great Britain, a world leader in electricity industry reform and electricity markets, recently decided to move back to the first approach (i.e., system planning) to decide how much and what type of new generation investments will be made. The Hinkley Point C nuclear electricity contracts are intended to drive new nuclear power investments that would not have been made in the electricity market. Financial evaluation involves analyses of discounted future cash flows. Commercial project cash flows that are more than about 25 years in the future have little or no value when discounted to today (i.e., have a net present value of zero). An investor looking at a nuclear power project would see a 10-year development and construction period with a large capital investment and would expect that the returns on this investment would come from cash flows during the next 15 years of operation (i.e., years 11 to 25). The traditional financial approach ignores 45 years (i.e., years 26 to 70) or more of additional operation and cash flows from a nuclear power plant. What is next for nuclear power? Nuclear power plant investments are comparable to long-term infrastructure investments such as roads, water/sewer systems, and electricity transmission networks. These long-term infrastructure investments are usually made by governments or regulated utilities to obtain the long-term public good they provide. Governments and regulators have the ability to make long-term investments that would not be made by private companies using commercial project financial analysis. All existing nuclear power plants are the result of investments made by governments and regulated utilities and all new nuclear power plants are being built by governments and regulated utilities. The UK Hinkley Point C incentive approach shows that intervention in electricity markets is needed to obtain a generation portfolio that is aimed at minimizing long-term system cost and ensuring reliable service by including nuclear power plants. An even better approach may be to recognize that nuclear power assets are valuable long-term infrastructure investments that are too important to be left to the market. Instead, nuclear power plants should be regulated or owned by governments.